Exactly three months ago today I published my first house related post after a long hiatus. 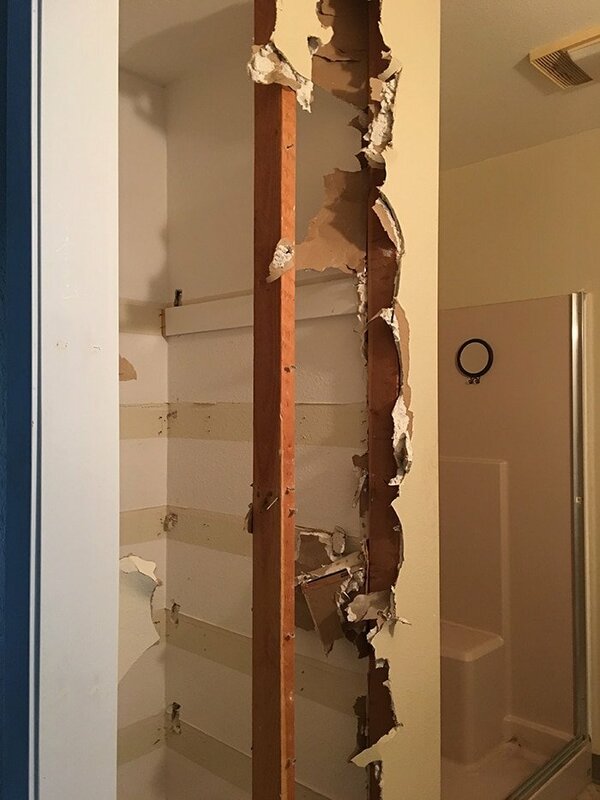 It was announcing the plan for my master bathroom—the first major renovation I’d be taking on solo, and one that I wanted to take more of a hands-off approach and let my contractors handle the labor. With all of the other projects going on at the same time (second entryway, guest bedroom and downstairs to name a few), a spark had been reignited and my passion for interior design was back. Back and stronger than ever. To be completely honest, I never thought I’d feel it again and I fought it for a while… but I guess that means this is what I’m meant to do. I’m in a different situation now but I can’t deny the joy and excitement of designing a room or the sheer satisfaction and sense of accomplishment of completing a space I’ve worked so hard on for weeks and months. 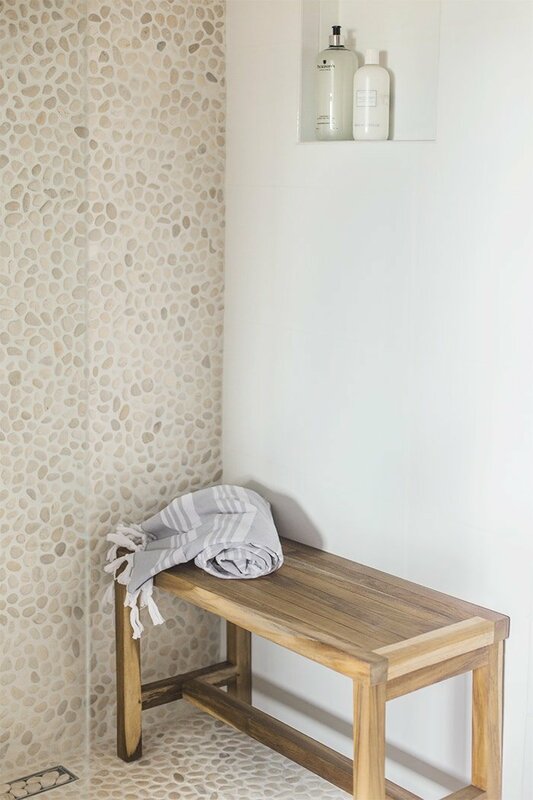 Thanks to The Tile Shop and my favorite sources like Wayfair, eBay and local thrift stores, I had no problems pulling my vision together and creating my dream spa bathroom without breaking the bank. And it has been really exciting these past couple weeks to watch the finishing touches come together. The tones appear warmer when the lights are on, naturally. I figured this house has enough neutral gray and chose Valspar’s Coconut Milk for the walls. 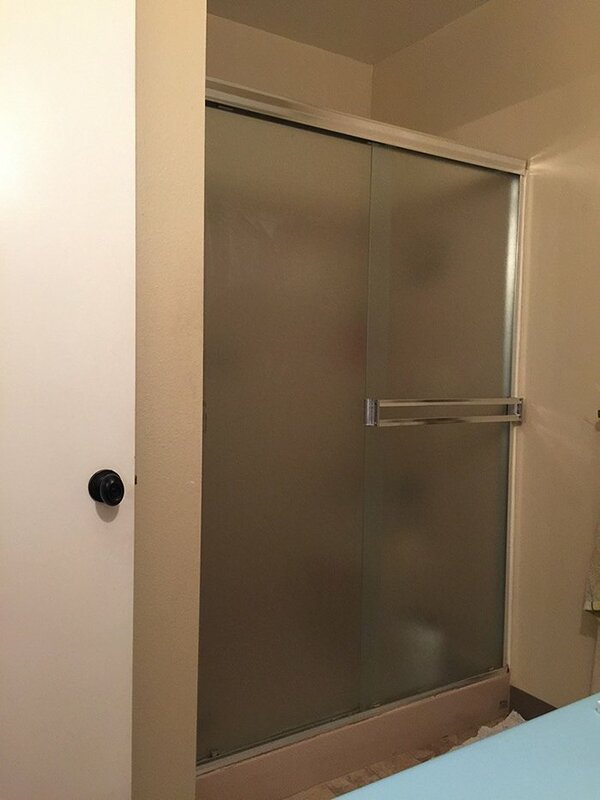 Using a solid panel of glass in place of a traditional door not only saved a hundreds of dollars, but kept the space feeling open and larger so this was absolutely one of my favorite design choices. I’m also glad I took the extra time to plank the walls rather than the beadboard I was originally planning. 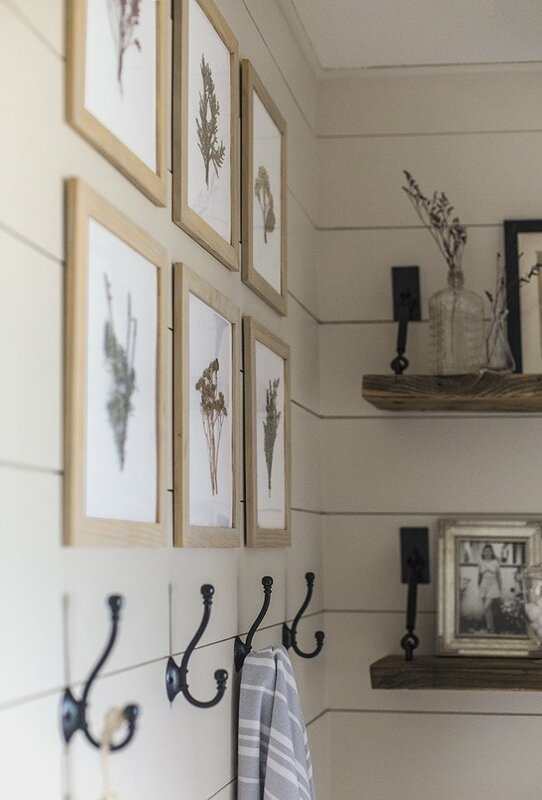 Simple glass canisters and vases, a few dried flowers and lavender, old frames and vintage photographs dug up from storage made this shelf styling easy and free. 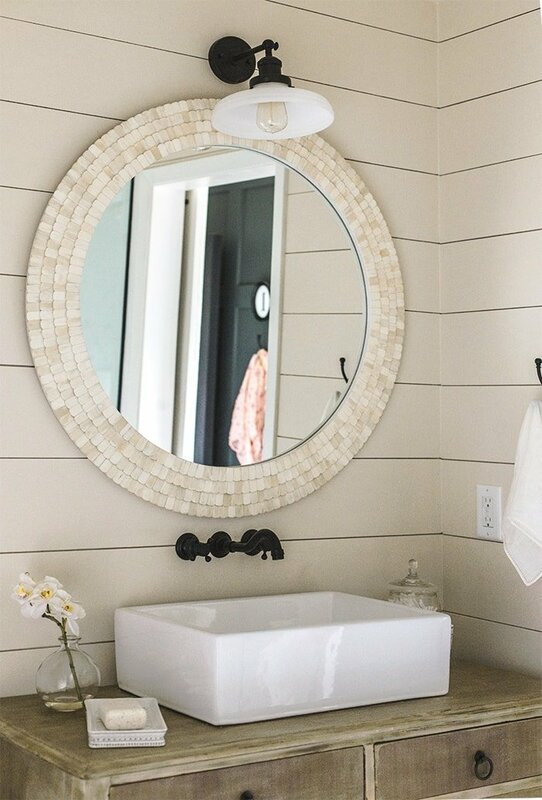 Don’t you just love that shell mirror and vintage sconce from Wayfair? Utilizing a variety of materials like shell, rock, wood, glass, metal and ceramic adds a ton of interest and texture. 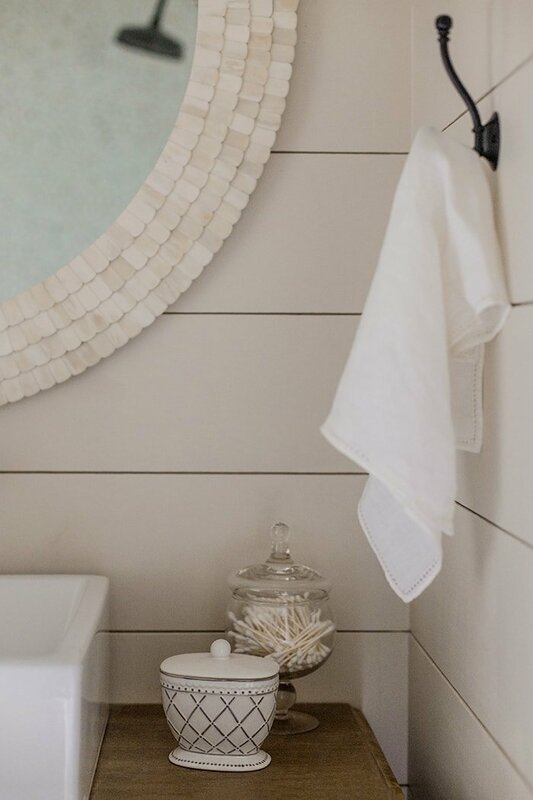 And keeping the color palette light and neutral helps the space feel calm—as a spa-inspired bathroom should! Alright friends, that’s another makeover in the bag. What do you think about this one? 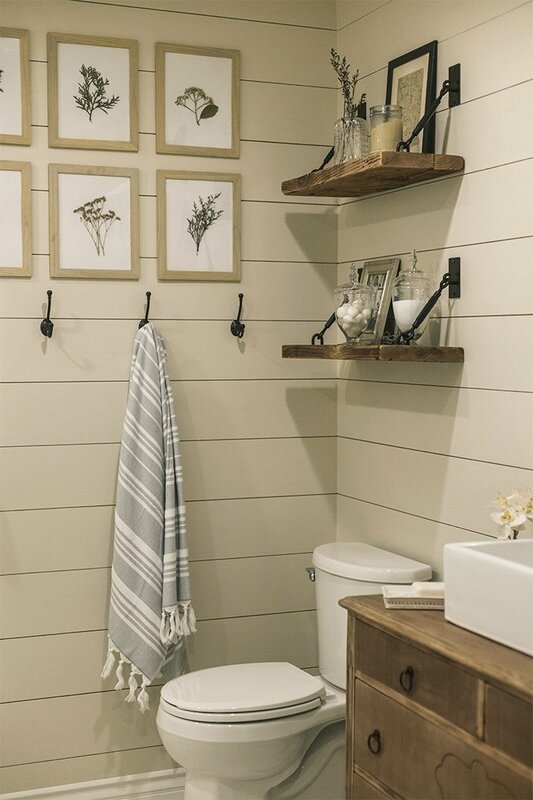 I think it gives my guest bath a run for its money… do you have a favorite? Let me know in the comments below or make sure to follow me where I’ll be posting previews of the other finished spaces—on instagram, facebook, twitter and snapchat @ jennasuedesign. I’m also working on house tour videos which I’ll be sharing on YouTube soon, so don’t forget to subscribe there too! UPDATE: Click here for links to all details & sources! Beautiful! I love how you did the glass wall divider. This has given me great inspiration for our own remodel. 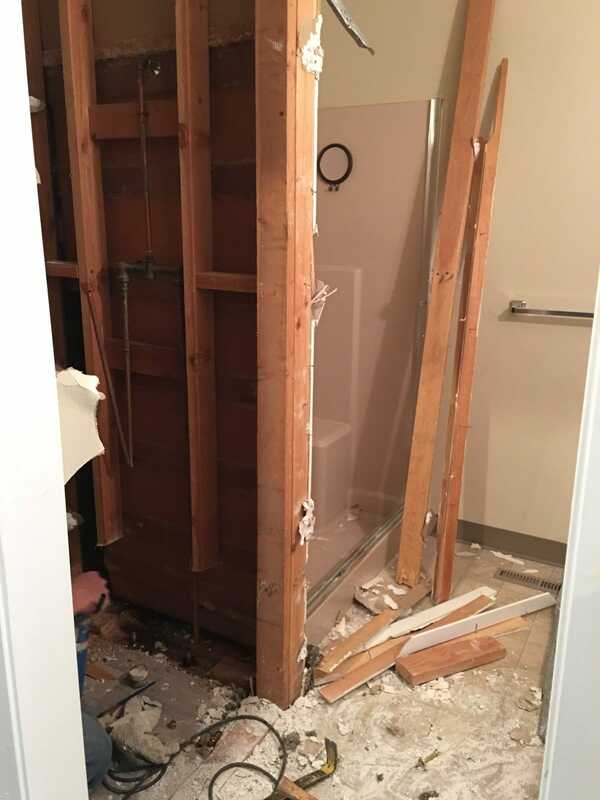 Do you have any issues with the bathroom flooding or water over spraying to the wall with the towels? Also, where did you find that bench? love it! I actually haven’t even had a chance to use it because I’m waiting on a replacement part for the shower head, but the ground is sloped pretty well towards the large drain and it’s a good distance to the back wall so I imagine it won’t be a problem. Bench is from Wayfair and source list coming Monday! WOW!….love it Jenna. You knocked it out of the park. (as you always do!!) I’m so happy to hear you got your design “mojo” back! I will always love how you are making our world more beautiful….one room at a time! Hugs to you!!! i’m always so blown away but the stuff you come up with. I wish i could bottle your talent and take some with me. this room is beautifully done like everything you work on. I can’t decide which bathroom I love more!! I love them both for different reasons!! You always to such an amazing job!!! So glad to hear you are excited about interior design again!! Your house will sell fast I’m sure!!! Can hardly contain my excitement to see where your life takes you next!!! Yes! Please share the coupon for the pebble tile! It is stunning and I would love to try out the tile vendor you used. It’s perfect! So glad you enjoyed the process and your passion is back! Gorgeous! Gorgeous! Gorgeous! So glad you are not giving up interior design! You are so talented. I love everything you do! This is so calming, and better than a spa. I love your whole home. Thanks for sharing your beautiful work! Love this makeover, so serene and spa like, just perfect! You’re such a talent, I’m glad to hear you won’t give it up. Could you please share some resources or tutorials for the antique vanity and the botanical prints/ frames? I am in awe! OOOPs, vever mind about the tutorials, I just saw your previous post about the botanicals. Thanks! 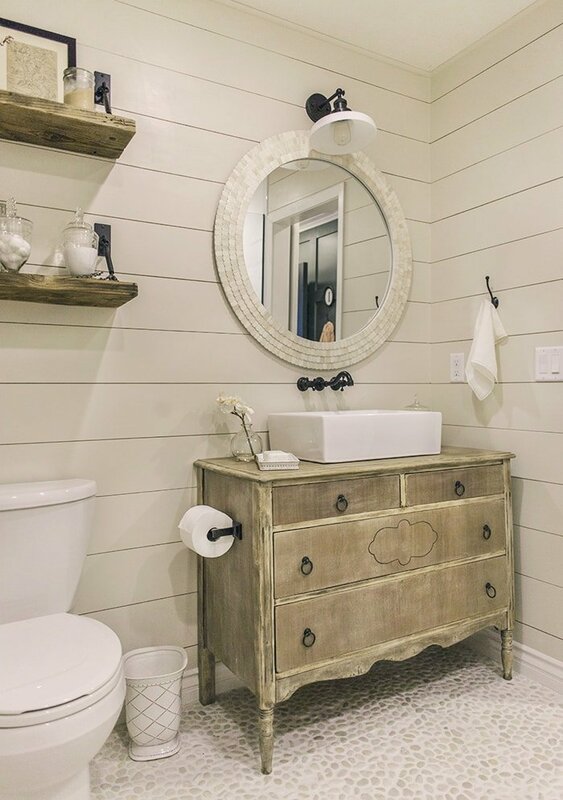 I love the finish on the vanity – how did you achieve it? This is INCREDIBLE. The difference is just… night and DAY. Thank you so much for the inspiration!!! You a a rock star at remodeling. Your style is so calming and fits everywhere. Glad you found your enjoyment in decorating. I felt so bad when you took your trip. I did enjoy your adventures as they were so descriptive and enjoyable. You went to place I never will and enjoyed them but I also enjoy your design also. Thanks for sharing both. Beautiful! It really is beautiful. I’m so glad you found your passion again. You have amazing talent and I was sad to see you were just walking away. Sometimes taking time for ourselves and clearing our heads helps us find what is important. That flooring looks SOOOO cool….love it! Btw, do you put some sort of sealer on the top of the vanity? This is absolutely stunning. I have to ask, how is the feel of the pebble tile barefoot? 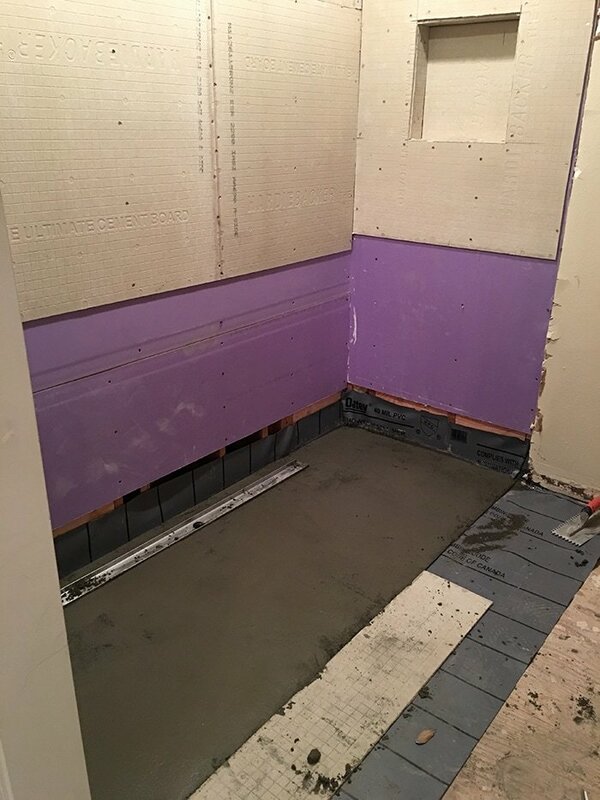 We put some very small square tile in the bottom of our walk-in shower and are just not fans of it. The tiny square corners are somewhat sharp where some areas of the floor are more raised up. We are contemplating pulling it out and putting down a pebble tile like yours. It actually feels nice! No sharp edges at all, it’s quite smooth and natural feeling. Beautiful! 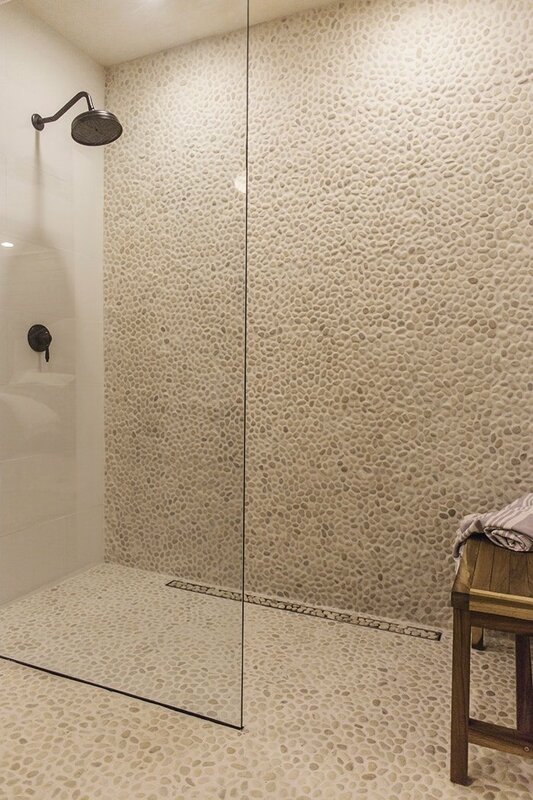 I like the glass wall, is it thicker than typical shower enclosures and does the water stay within the glass area? 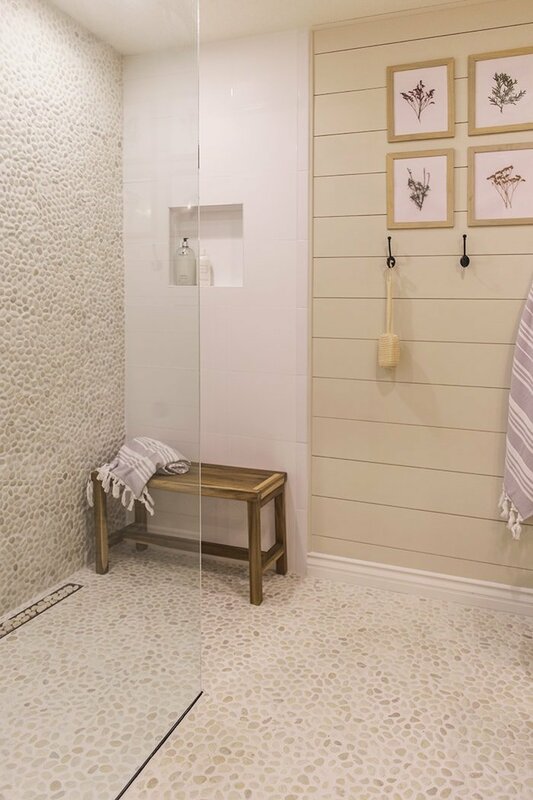 What is that narrow section on floor in shower, is that for looks or draining? Glad to hear that the design and remodeling passion is still alive. We recently remodeled our main bath and have yet to add hardware and racks, would love to get your ideas. Hmmm, both baths are lovely although I’m a bath girl, I think I’m leaning toward the pebbled bath; it is so inviting and spa like. The pebbles must feel great on your bare feet. Stunning! 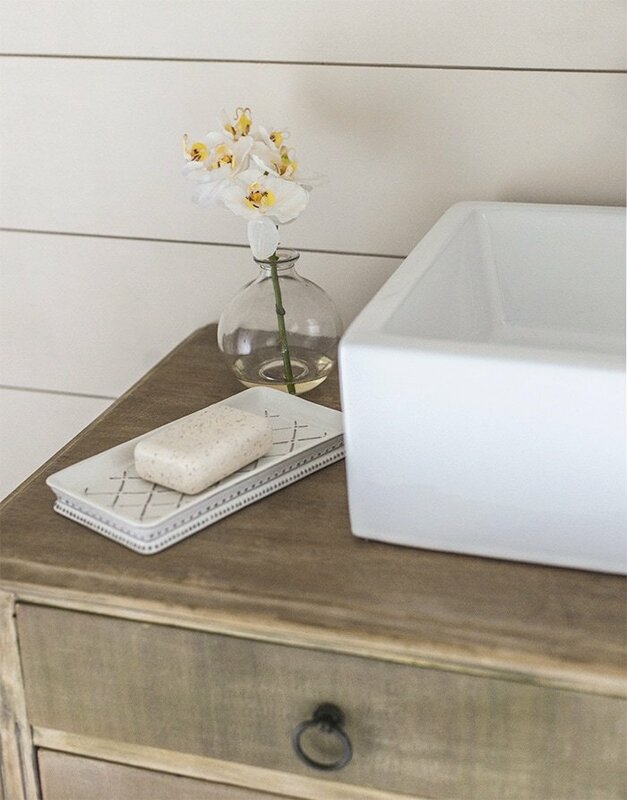 Serene with lots of natural materials and tones. 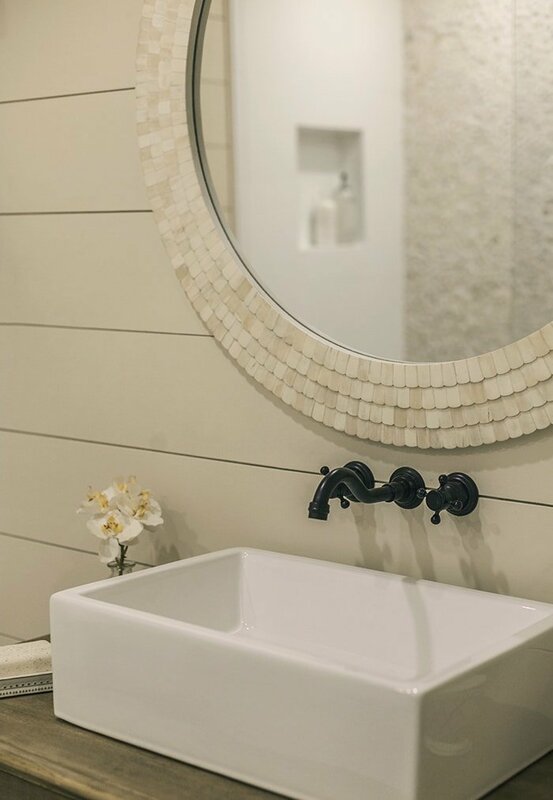 It’s everything a master bath should be. Congrats on a job beautifully done! How does pebble tile feel on bare feet? Is it as comfortable as a flatter tile, or is it hard on feet? It feels much smoother than it looks! So beautiful! Just really natural and pretty! Oh my word….absolutely stunning. I don’t know that I could choose one bathroom over the other. The main bath is more farmhouse for sure whereas this one is definitely a spa retreat even with the vintage dresser but I do love them both. This is just perfect. All of it. Looking forward to Monday’s post with all of your resources and details. Curious to know if the tile is slippery when you actually get to use it and how the water drains — if it drains as you expect it to. Also looking forward to what’s next in your journey. Beautiful! Both bathrooms are. I’d buy your house in a heartbeat if I were in CA. You have amazing talent and I’m sooooooo thankful this is not the end of your design journey. Have a great wknd and thank you for all you do for us readers! Beautiful job, just beautiful. I confess that I was at first dubious about the rock tile (I have a home which had to be built on top of deep layers of river rock and I’ve just about had it with that…) BUT I was converted when I saw how you blended it with all those great textures. I especially love the sleek look of the glass pane, right there up against the rock floor. Super contrast. Some kind of modern and rustic all rolled in one. Hope your enjoyment in decorating continues, I will be certain to follow your work for as long as you do it! 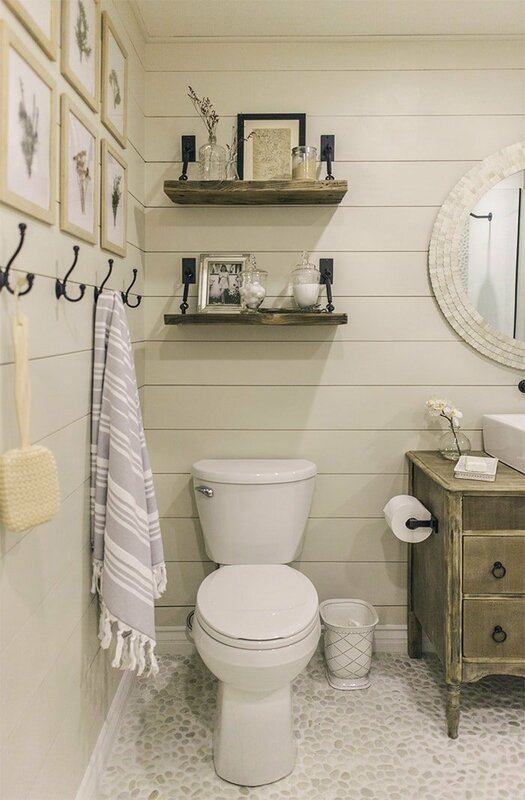 Can you tell where you got the black hardware for the shelves above toliet? Also along with the hardware were did u get the boards for the shelves or what kind of boards r they?? Beautiful bath. Thanks! They were just old boards sitting in my garage, I think from a lumber yard a while back. Wow! When my bathroom grows up it want to look just like yours! Amazing transformation! I am pinning so I will have all those ideas ready! Amazing! Can not stop drooling over every single little detail. You have the magic touch is all I can say. It’s absolutely beautiful! I was thinking of a wall in our masterbath, but wondered how to turn on the water without getting wet. Are you able to do that with you shower? It’s absolutely beautiful! 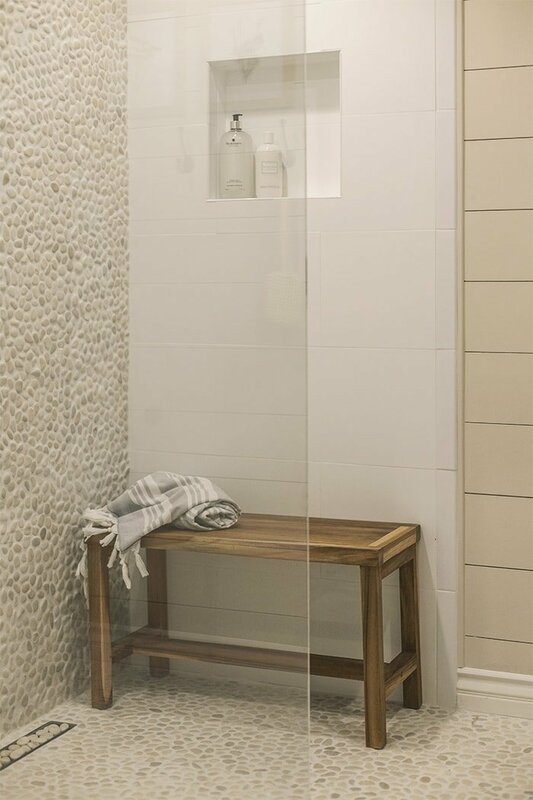 I was thinking of a stationary glass wall in our masterbath, but wondered how to turn on the water without getting wet. Are you able to do that with your shower? beautiful bathroom. but i’m really interested in the 2 bottles that you have in your shower on the shelf. i’ve seen the large bottle before, soap? home goods? the name escape’s me. 🙁 petunia, something with a p????? please help me. I can’t even begin to put into words how much I love this bathroom. I don’t think I’d ever leave that shower. The bathroom turned out beautiful! It’s so gorgeous. Can’t wait to hear what you have planned in the future! Great job per usual, Jenna! I’m speechless! 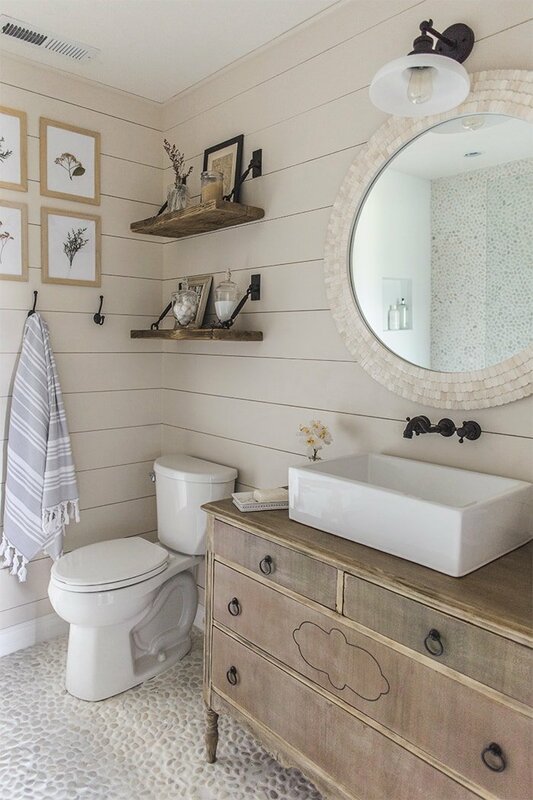 I am head over heels in love with every detail of this bathroom! I considered using a pebble floor for our mudroom, but ultimately used brick. I can’t wait to find a space to use it in now. It is stunning, well done! I see we also share a love for pressed botanicals. The best part of this post was reading your re-ignited passion for interior design / renovations. I read a whole bunch of DIY design blogs but your talent and vision always excites me the most. I’m interested in how you finished off for pebble tile at the walls and threshold. 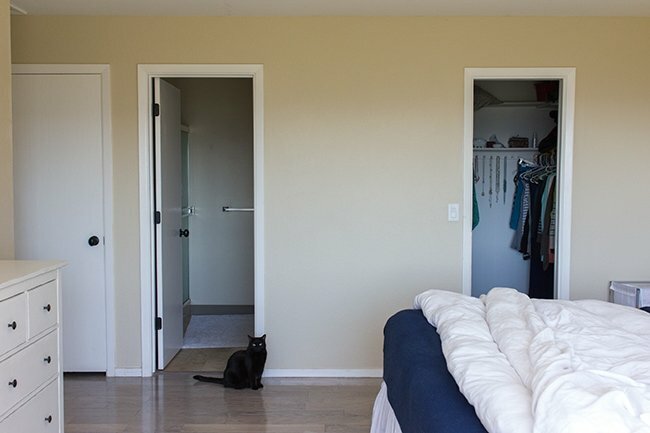 Did you pull off the baseboards and then reinstall once done? If so does it look uneven at the place where they meet? 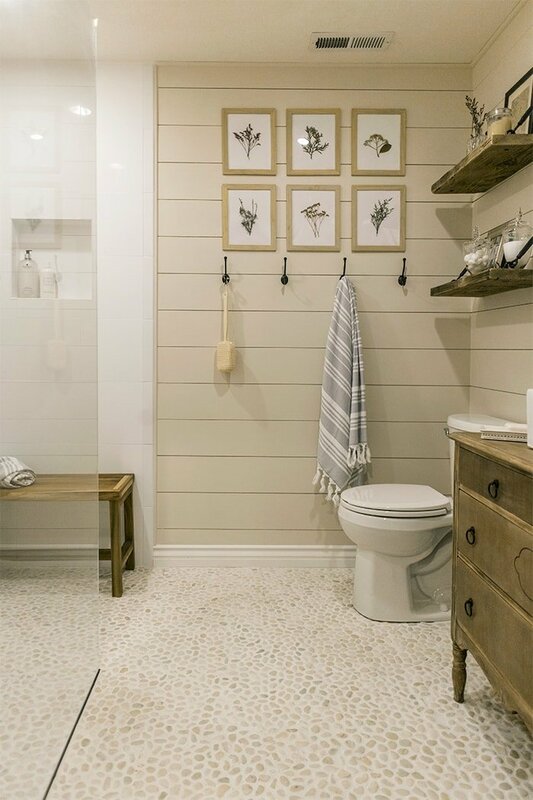 I want to do similar in my bath but am worried the transition from tile to carpet and from tile to baseboard will look weird. The pebbles were cut so they lined up cleanly and I added the baseboard and threshold at the end to cover any gaps. Did you cut some tiles in half or did you pull some off spare sheets and squeeze them in? 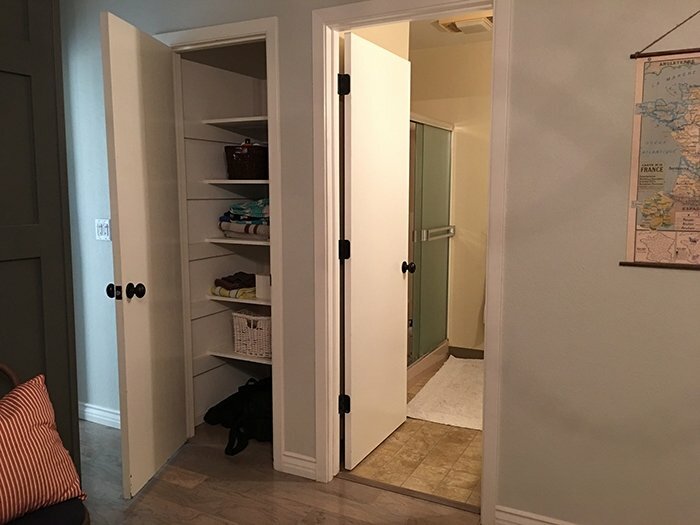 What did you use to transition from the bathroom to bedroom? My tiler installed it and I believe he just cut them. I reused the existing wood transition piece. Beautiful! Can you tell me the before and after dimensions of the shower? I love it, it looks amazing! Every detail is fabulous! Everything about this is perfection! 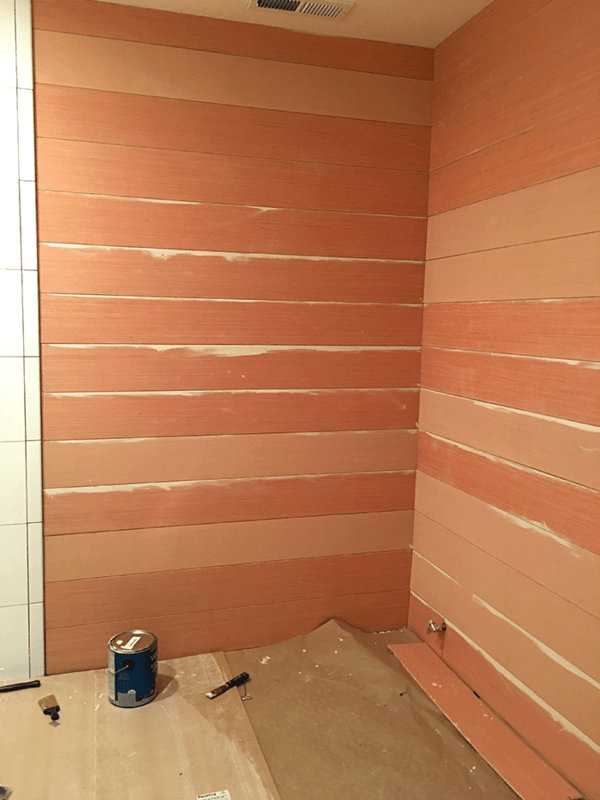 Can I ask a quick paint question – did you use flat or eggshell? Thanks! 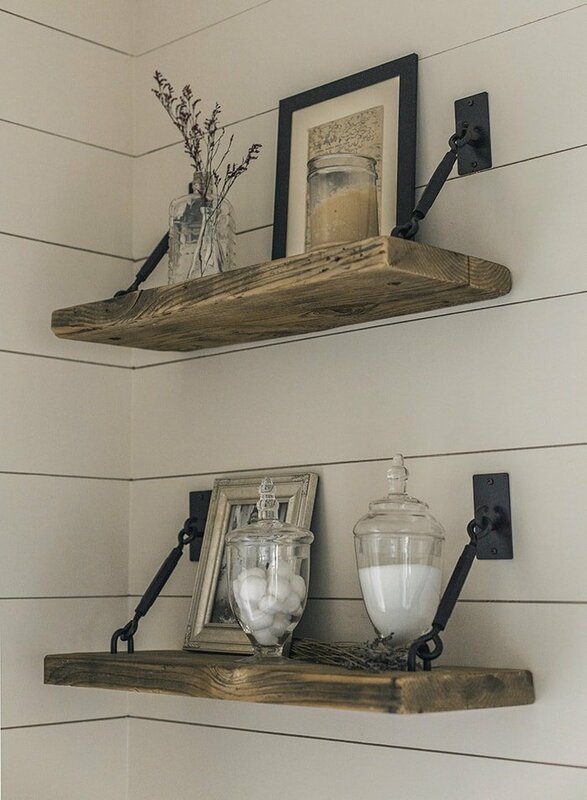 Can you share where you purchased the shelf hardware? Thank you! Love!!! Can you share the paint color? 🙂 I’m struggling with no natural light in mine either and this is so nice ! Hi, great work. Looks amazing, where did u purchase the sink? Thanks, Wayfair! There’s a link in the source post. I cannot decide on just one item. It’seems all just so perfect. I see your sink taps come out of the wall. I’mean assuming you have access to pipes on the other side of that wall. And that shower!!!! And the sliding door! I want that bathroom. Beautiful bathroom. 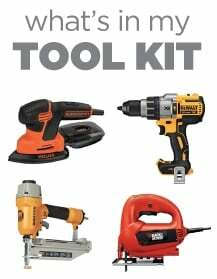 Would you please let me know where you purchased the hardware attached to the shelves the the master bathroom. They are just what I am looking for. Thank you. I LOVE this! 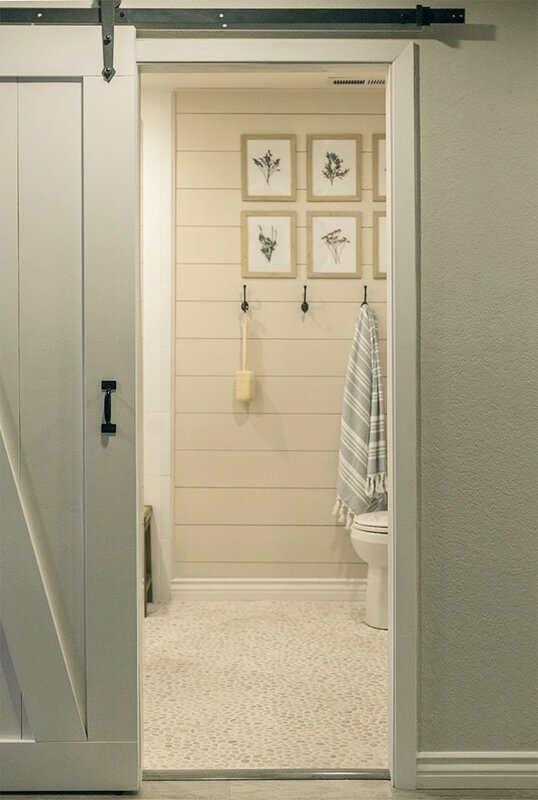 I too have thought about beadboard vs shiplap in my bathroom and you have sold me on the shiplap. 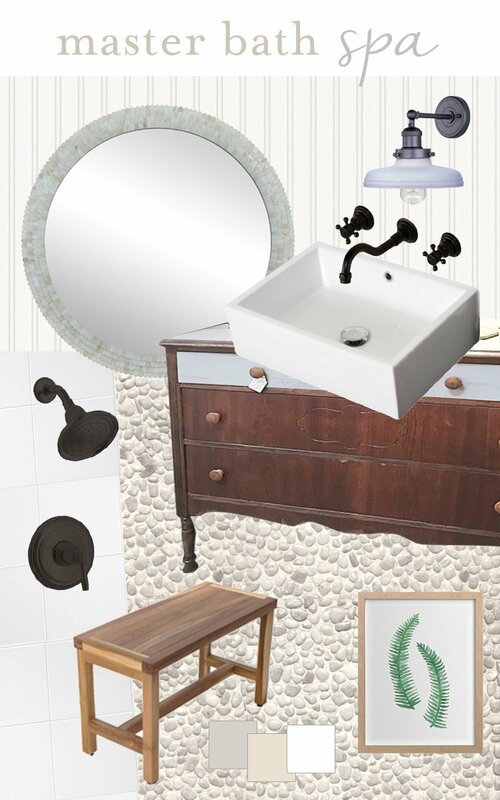 Everything in your bathroom is perfect, from the barn door, to the pebble floors, and the dresser turned vanity! Absolutely beautiful job! 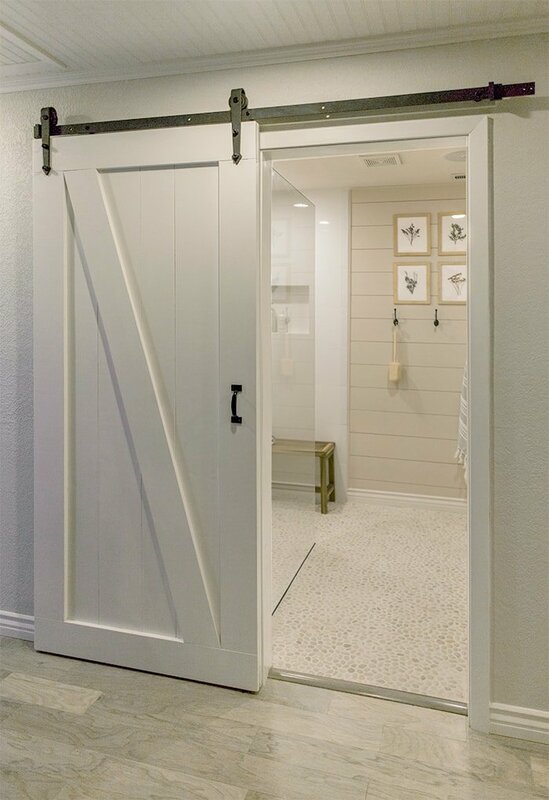 I love your barn door!! Where did you get the hardware to hang it? Hi Lindsay, it’s from Ebay! There’s a link to the sources at the bottom of the post. How did you do the shelves? Where did you get the hardware? I LOVE seeing this flooring laid out. It’s similar to what I chose for our bathroom last year. We had to put the remodel on hold (again), with hopes of getting to it at the first of the year. We’ve been going back and forth on flooring, but now that I see it, no contest! 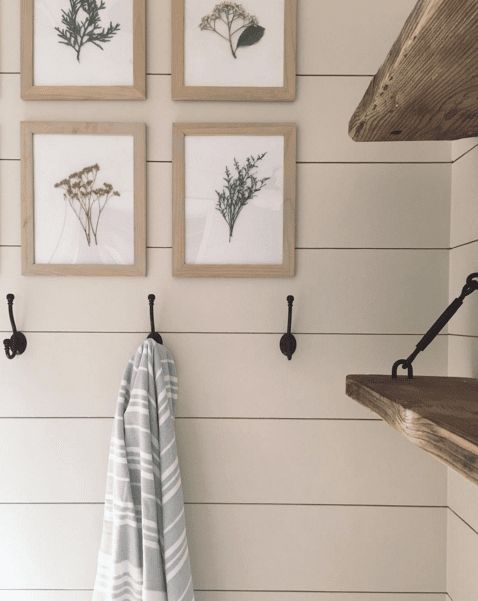 Jenna-how did you paint shiplap? 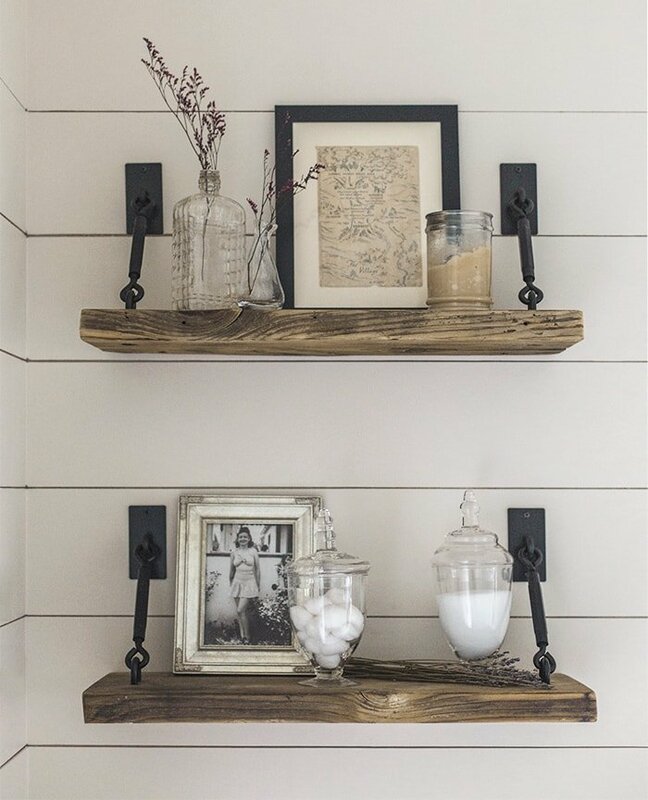 Did you use shiplap or cut plywood? 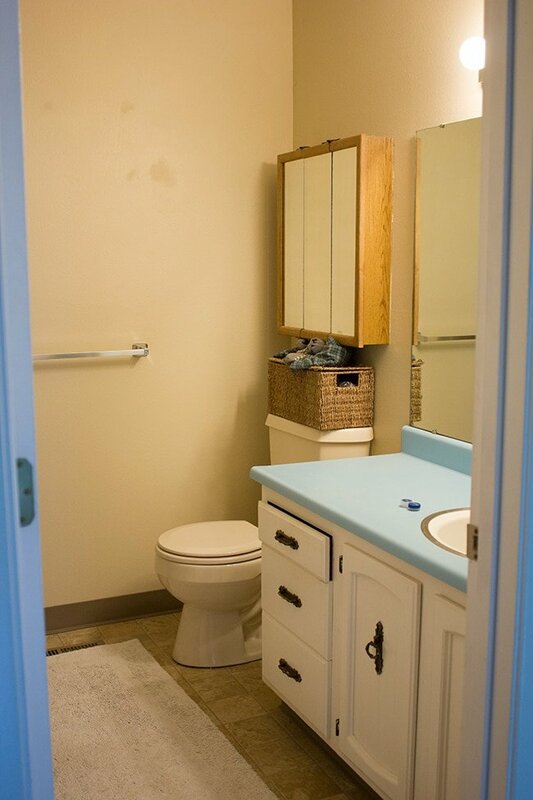 We did this is a bathroom and the paint job wasn’t a nightmare. Trying to figure out where to go from here.